There are certainly more comfortable ways to go to hospital than a motorbike with a sidecar bed attached to its side. 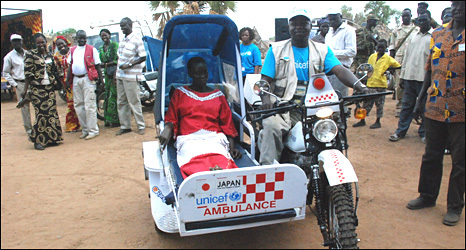 But the launch of these ambulance motorbikes in South Sudan is a serious attempt to tackle some of the world's highest rates of women dying in pregnancy. A woman has a one-in-six chance of dying during pregnancy during the course of her lifetime in this underdeveloped region scarred by two decades of war, according to the United Nations. A 15-year-old girl is more likely to die in childbirth than to complete school. Many of those deaths are easily avoidable if even basic medical support were available, experts say. "Our place here is very big, and the health centre is only one," said Susannah Patrick, a health worker in the small village of Hiyala in Eastern Equatoria State. She points to the rough and dusty track through her small village, a scattered collection of tin shacks and thatch huts. Children play on the gun barrel of a rusting tank, a relic of Sudan's long years of war. Only the toughest of vehicles travel these roads. "If a woman is pregnant and she goes into labour, it is very difficult to get her to the health centre within a short time," she says. That is where the motorbike ambulances are supposed to help. The few health facilities are scattered across this remote land, and getting to them is a big problem for many. Half of all deliveries are done without trained health workers, while 80% take place outside a health facility. South Sudan is a vast region - about the size of Spain and Portugal combined - but its roads were left in terrible conditions by 21 years of civil war. Peace came four years ago, but public transport remains rare on the rough tracks that connect even the region's biggest towns. Some 90% of the population lives off less than $1 a day, and many are too poor to hire transport if they are sick. In the rainy season, many tracks become impassable to normal vehicles. The motorbike ambulances have just started work in Eastern Equatoria State - one of the areas hardest hit by the long years of fighting. The sidecar bed has padded cushions and powerful suspension to cope with Sudan's rough roads. The patient can lie flat, with seat belts to strap them in, but there is also space for a health worker to support the woman too, if needed. There is even a special shade to cover the patient from the baking sun. "The advantage of the motor bikes is that they can easily be managed at a lower level health facility," said Joyce Mphaya, a safe motherhood specialist with the UN children's fund (Unicef), which donated the bikes. "It is cost-effective in terms of fuel, and you can easily move with the motorbikes to remote places, where there are no roads and where cars cannot go." The five bikes - each costing $6,000 (£4,100) - are part of a pilot scheme, which if successful, could be rolled out elsewhere in the region. "We have a transport problem of bringing the critically sick people to the few referral facilities available," said Atem Nathan Riak, head of primary healthcare for South Sudan's autonomous government. Each county in the south is due to receive a four-wheeled ambulance this year, Mr Riak said. But he says that more transport facilities are still needed badly. "If the motorbikes work, we will go for it, and expand their use," he adds. 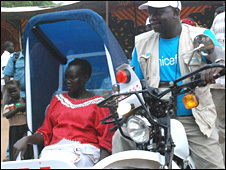 Sudan is not the first to use motorbike ambulances. In Malawi, similar bikes helped more than halve maternal mortality rates over a period of four years. They also helped halve the numbers of emergency caesarean sections, because they got the women to hospital before an operation was needed. In South Sudan, girls often give birth at a young age, meaning complications in pregnancy are all too common. The arrival of the motorbikes has therefore been welcomed warmly by local people, who say they hope that the vehicles can cut down the numbers of women dying.